Jefferson Community Health & Life Gardenside is a 40-bed long-term care facility providing rehabilitation services for those who have had injury or illness and a home for those who can no longer remain in their own homes. Like a family living room, a beautiful day room greets visitors and provides a place for residents to enjoy meals, relax and watch television with others. 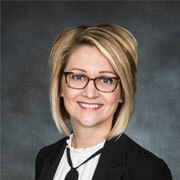 For any questions or concerns, please contact Gardenside Administrator Deb Sutton, RN at 402.729.5220 or Deb.Sutton@JCHealthandLife.org. Our professional nursing staff provides compassionate, quality care for residents 24 hours a day. 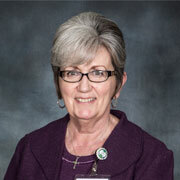 Licensed nursing staff will coordinate lab, x-ray, medications and follow-up medical appointments for all residents. Nurses are available to assess any medical concerns and will communicate those assessments with your physician. Trained staff will administer medications as ordered by your physician, and our direct care staff will assist you to meet your personal care needs. 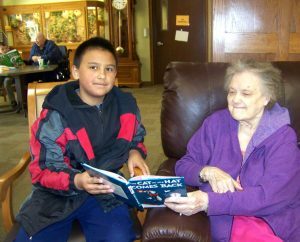 The Social Services staff at Gardenside serves to meet our resident’s psychosocial and emotions needs. 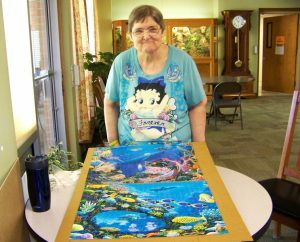 Their responsibilities include coordinating admissions, assisting residents with scheduling appointments (eye, dental, hearing aides, etc. 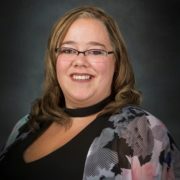 ), providing transportation to and from appointments, finding resolutions to conflicts and assisting with resident discharges. 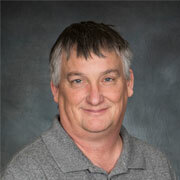 Social Services staff is available Monday through Friday from 7:00 am to 4:00 pm. 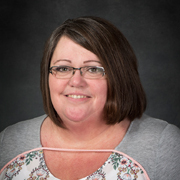 Our nutrition services department provides meal service, special diets, supplements and snacks. 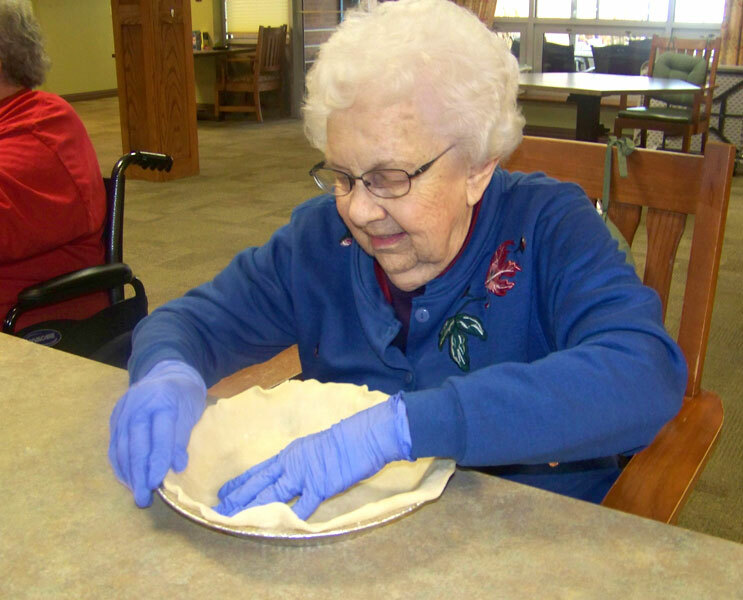 Residents have a choice of entrees for each meal, along with a variety of side dishes. Hot breakfast is offered 7:30 am to 9:00 am in the dining room. A continental breakfast is available prior to 7:30 am or until 11:00 am if desired in the dayroom. Lunch is served from 11:45 am to 1:00 pm, and supper is served from 5:30 pm to 6:30 pm. 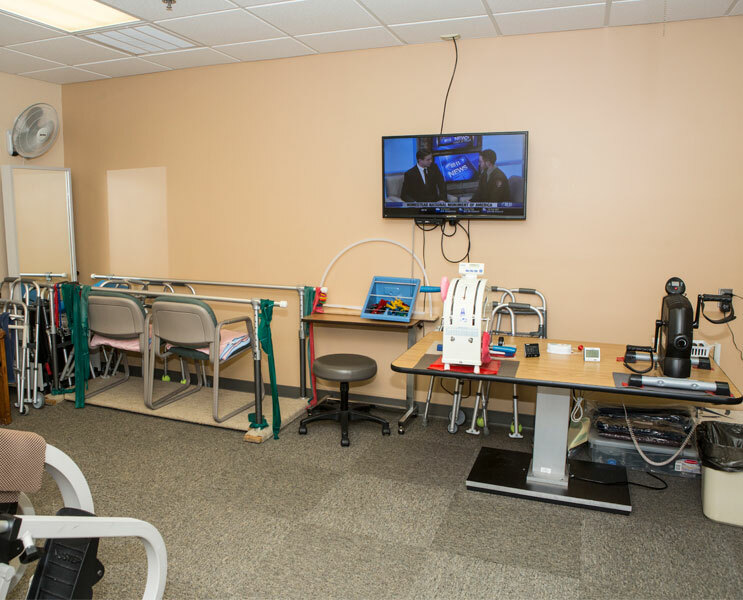 If an individualized rehabilitation plan is appropriate, our staff works with an interdisciplinary team to establish a plan. If a resident is receiving physical, occupational or speech therapy services, our therapists work with our rehabilitation department. Specially trained rehab aides assists residents with exercise and strengthening regimens. Our rehab room is equipped with a wide variety of equipment to meet the needs of our residents. 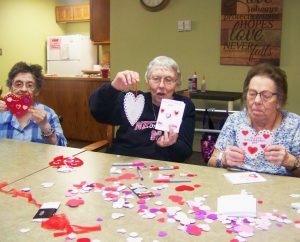 A wide variety of activities, including games, crafts, entertainment and sing-a-longs are offered for all residents. 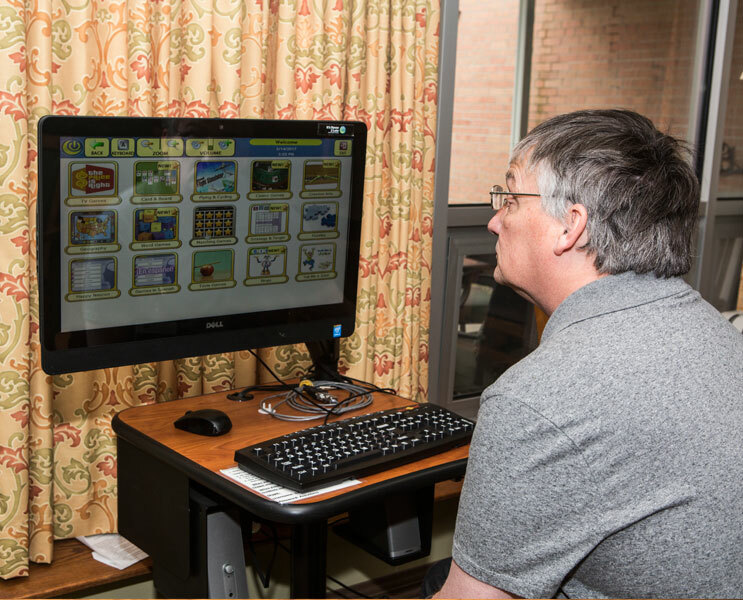 The Activities Department staff members plan group and individual activities to provide enjoyment, entertainment and education to residents. We take bus trips to see local areas of interest, community celebrations and former farms and homes. Care conferences are held regularly for all residents, inviting family members to discuss their loved ones’ care with staff members from all of the areas involved in the residents’ care. 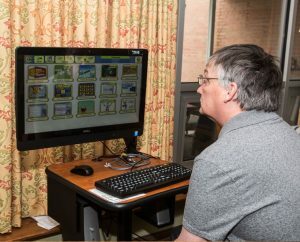 Residents elect their own Residents’ Council, which gives the staff feedback on desired activities, changes to make life better for residents, and what types of food residents like. Monthly Residents’ Council meetings also provide a forum for questions. The monthly meetings are also informative, letting council members know about new things going on in the facility. Private phone lines for local calls and television hookups for basic cable services are available for each resident in the room at no charge. Long distance telephone service is available for an additional fee. 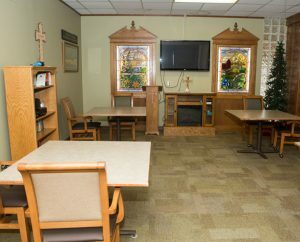 Residents and visitors can also use the big screen televisions in the dayroom, chapel area and dining room. Worship services are offered each Sunday afternoon, with area ministers rotating to provide the services. Church service and Bible studies are held in the Gardenside dayroom/chapel. Special holiday parties and buffets are held periodically throughout the year. Activities are planned for residents and their family members to enjoy, including entertainment, crafts and games. Families are encouraged to use our facilities for gatherings and are asked to contact us to reserve spaces. A beautician who works as an independent agent offers a variety of services in our beauty shop, including haircuts, styles, perms and coloring. The resident or their family is responsible for the costs of these services. 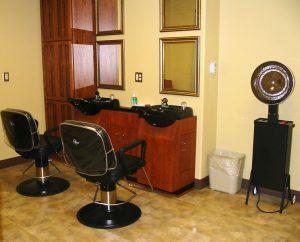 A beautician or barber of the residents’ choosing also may use our shop at no cost, but these appointments must schedule with the social services department. Gardenside publishes a monthly newsletter, available by mail free of charge for all subscribers, including family members of residents, volunteers, community members and others. The newsletter can be downloaded from the website for your convenience. To download, click “Download Gardenside News” button above. 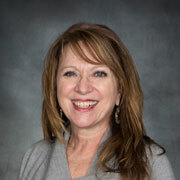 To subscribe, please contact editor Lana Likens at 402.729.6855 or Lana.Likens@JCHealthandLife.org. Gardenside has served the long-term care needs of the community since 1963, and was part of the first new combination hospital and nursing home built in Nebraska. There have been many changes over the years, including additions, remodeling and new programs and services. 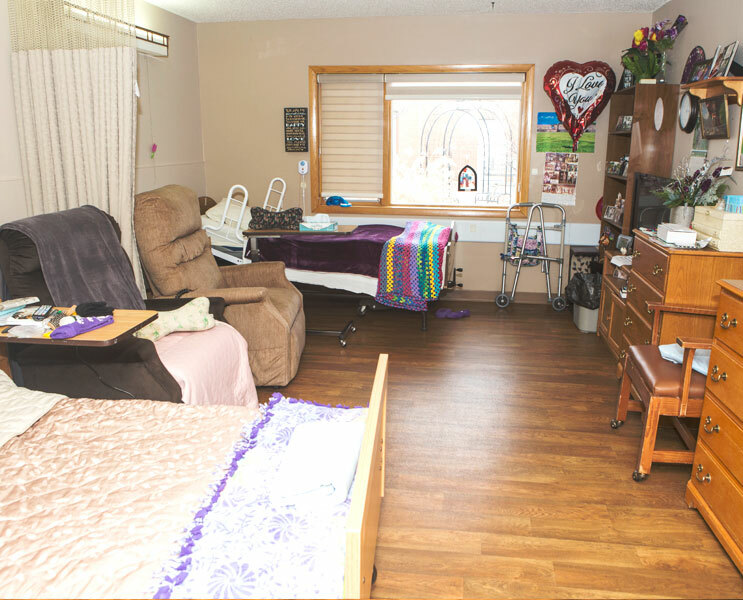 Gardenside is now licensed for 40 beds, including one hospice bed. 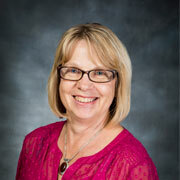 Gardenside has once again received a 5 Star Quality Rating from the Centers for Medicare and Medicaid. Gardenside received this honor in 2008 when the rating system was first established and has remained at a 5 Star Rating since that time. Facilities are assigned star ratings from a low of one star to a high of five stars based on health inspection surveys, staffing information and quality of care measures. 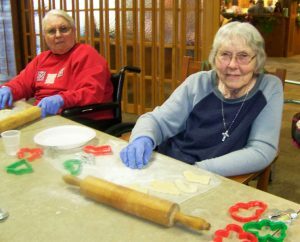 For more about the rating system, visit Nursing Home Compare. 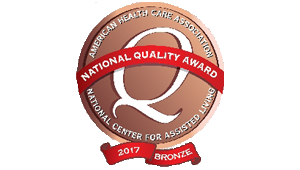 Gardenside was recognized as a 2017 recipient of the Bronze Commitment to Quality Award for its dedication to improving the lives of residents through quality care. 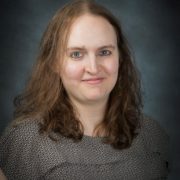 The award is one of the three progressive award levels through the National Quality Award Program, presented by the American Health Care Association (AHCA) and the National Center for Assisted Living (NCAL). Gardenside is one of 13 Nebraska facilities to earn the bronze award for 2017. Click here to read more about this honor. 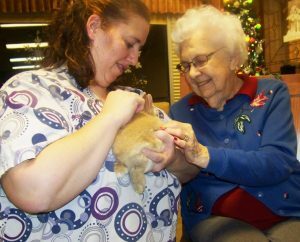 Gardenside welcomes visitors and has no set visiting hours. Family and friends are encouraged to visit as often as they are able. We do ask for consideration of other residents’ schedules and privacy. The main Jefferson Community Health & Life entrance is open from 5:00 am to 9:00 pm Monday through Friday and from 7:00 am to 9:00 pm Saturday and Sunday. Please use the Outpatient/Emergency entrance if you need to enter the building after the main lobby doors are locked for the night. You will need to pick up the phone to ring a nurse to unlock the interior door. You may also use the entrance on Gardenside’s west wing. This door is usually open from 7:00 am to 9:00 pm. There is a doorbell at this entrance which can be used from 9:00 pm to 7:00 am. You may want to share a meal, an activity, entertainment or special occasions here at Gardenside. Residents, if able, may go for rides or activities with family members outside of Gardenside. Please check with the nursing staff about making these arrangements. Visitors are also welcome to join residents for meals. There is a per-meal charge. Guest meals are $5 per meal or $10 for holiday meals (tax included). To make planning easier, please notify the charge nurse a day or two in advance (three days for large groups) if you will be joining us for a meal. Please pay for guest meals in the cafeteria. 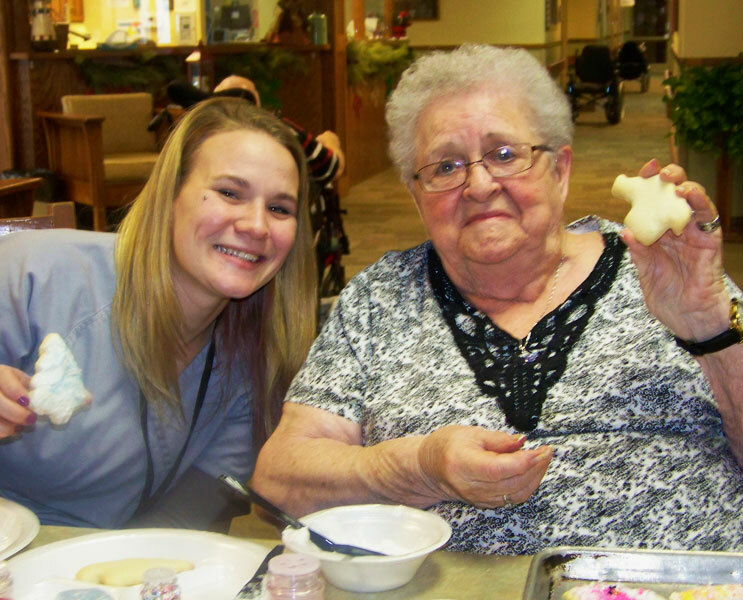 The charges for nursing care and services provided by Gardenside depend upon the care needs of the resident. 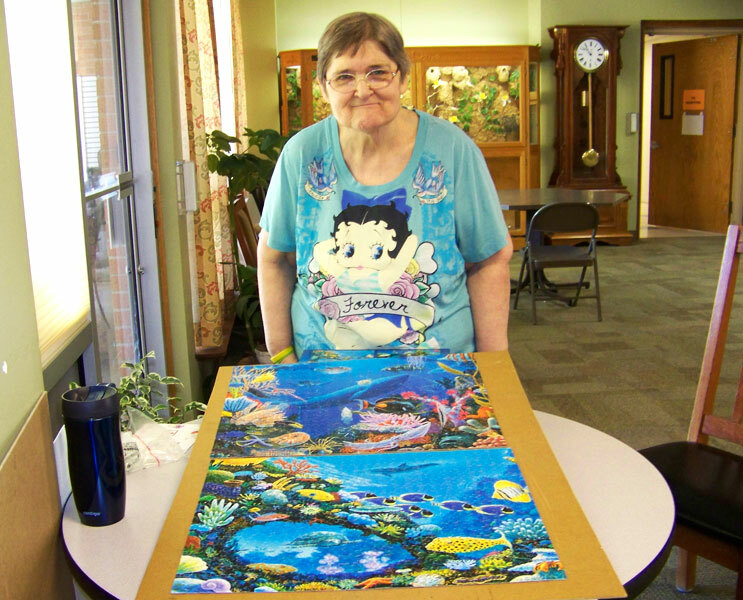 Our services are goal-oriented to restore each resident to his or her highest level of independence and comfort. 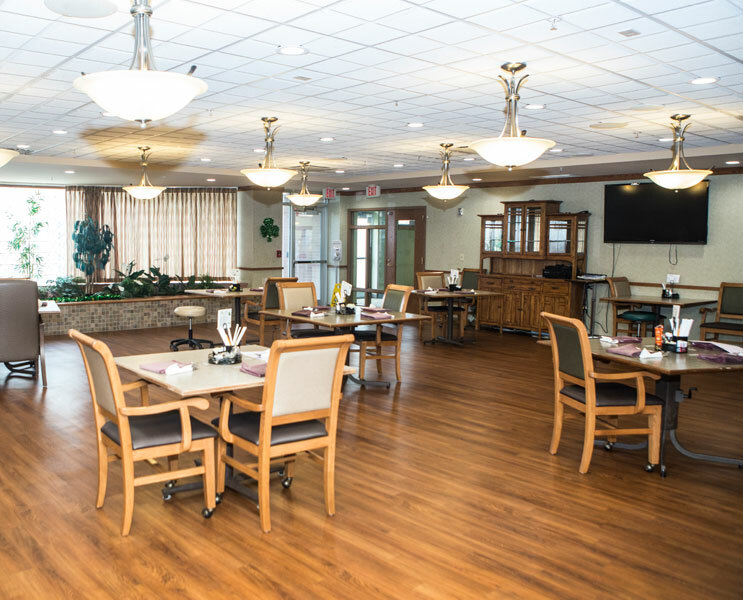 The rates at Gardenside are based on six levels of care that describe the types of care a resident may need. The six levels are determined through a state approved assessment evaluation that is updated at regular intervals to reflect changes a resident may experience. The evaluation reflects the amount of assistance and nursing care needed by the resident in the activities of daily living and other social and emotional areas. Each resident is admitted at a Level 4 (either private or semi-private) room level until the assessment phase is completed. Rates are then adjusted as necessary, depending upon the care required. We do not require a down payment as in many other facilities. Rates are $166 per day for a resident at Level 1 in a semi-private room, and go up to $278 per day for a resident at Level 6 in a semi-private room. 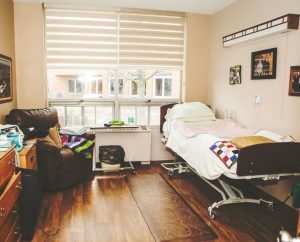 A Level 4 (where a resident will be admitted at until assessment is fully completed) is $231 per day for a semi-private room. For a resident at a Level 1 in a private room, the charge ranges from $179 per day to $291 per day for resident in a private room at Level 6. A Level 4 is $244 per day for a private room. In order to be admitted to Gardenside, you must have a primary care physician at Jefferson Community Health & Life Fairbury Clinic. Our daily rates are very competitive and frequently less than other area facilities. We include most supplies in our daily rates, as opposed to charging for each individual item needed. Transportation, to and from local medical appointments, within 30 miles. We encourage family members to accompany residents to appointments out of town.